Scientists have watched a cell's genetic machinery in the first stages of 'reading' genes, giving a potential way to stop the process in bacteria. By reading certain genes - a process known as transcription - cells can produce and regulate proteins, which perform almost all the functions necessary for life. Understanding how the fundamental machinery works hopefully gives us additional tools for developing new kinds of antibiotics. As we investigate more steps in the process of transcription, we may find more stages during which we can intervene and attack harmful bacteria. 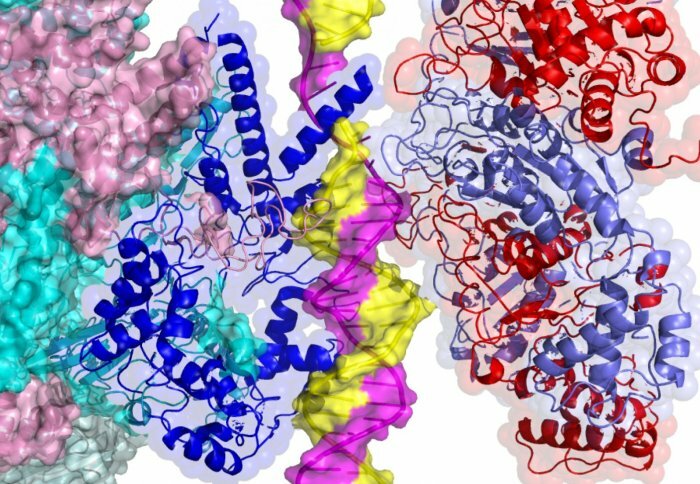 In the new study, researchers used an extremely powerful technique called cryo-electron microscopy to physically see how this process happens in detail, for the first time. The insights could help researchers target this stage of transcription in bacteria with new antibiotics. DNA is composed of two strands, which are normally linked together in a twisted helical structure. The strands are pulled apart by several specialist molecules that ‘melt’ it – preventing the strands from coming back together as they normally try to do. This step in transcription usually happens very quickly, with a lot of changes occurring over a short time span, meaning it has been impossible to track in detail before. In the study published today in Molecular Cell, the research team led by scientists at Imperial College London viewed the DNA opening in action. Since transcription of DNA is so fundamental to the functioning of a cell, the team believe that knowing how it operates in bacteria could provide avenues for blocking the process, potentially shutting down the actions of harmful infections. Lead researcher Professor Xiaodong Zhang, from the Department of medicine at Imperial, said: “Bacteria are becoming increasingly resistant to antibiotics, so our insights into the first stage of transcription provide new ways of thinking about stopping bacteria. The process of transcription occurs in all living things and plays a crucial role in many cellular processes, including those related to diseases like cancer. The new insights might therefore apply across a whole range of organisms and disease processes. In particular, the team studied the action of a protein called sigma54, which controls a wide range of bacterial defences, holding them back until they need to be used. If drugs could be designed to interfere with this step, and preserve sigma54’s power to hold back defences, they could make bacteria more vulnerable to attack. Sigma54 unleashes the bacterial defences after being activated by a protein that changes sigma54’s shape. 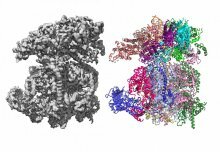 The ‘activator’ protein, together with sigma54, then forms a protein wedge that drives the two DNA strands apart. The bacterial defence genes are then read and kicked into action. The researchers were able to watch this transcription process in detail, giving them new insights into how they might use sigma54 to disable the bacteria’s defences. Study co-author Professor Martin Buck, from the Department of Life Sciences at Imperial, said: “DNA contains genetic information, which is converted to proteins that carry out all cell functions. Transcription is the first stage in accessing that information. 'Structures of RNA polymerase closed and intermediate complexes reveal mechanisms of DNA opening and transcription initiation' by Glyde, R et al. is published in Molecular Cell.